Children's rooms can be in the west, north or east of the building. A west side bedroom is best for children. An eastern bedroom can also be used for unmarried children or guests; but a room east is recommended for a newly-wed couple. 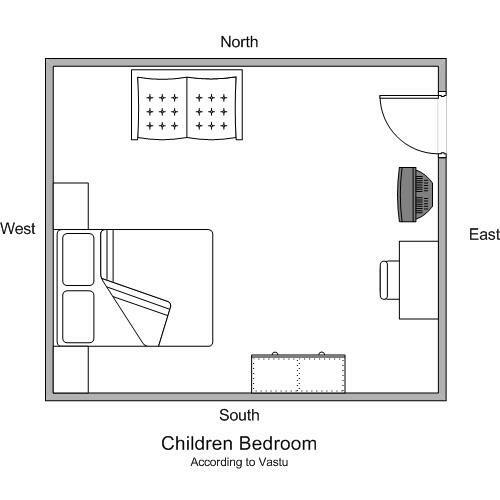 The beds in the children's room can be in the southwest portion with heads in the east or south direction. As a general rule of Vastu, there must not be any mirror opposite to the bed a bedroom. A television screen is also considered as mirror, when turned off, and so even a TV is not allowed to be kept exactly opposite to the bed. But as people generally insist on keeping a TV in bedroom, it can be kept to the right or left of the bed at angle for a comfortable view from bed. An up lighter in the southeast corner of the bedroom brings positive energy and good health. Always ensure that the center place of the room is empty i.e. never place any furniture in the center of the room. The furniture in the room should be placed a few inches away from the walls, as it saves the positive energies of body and mind. However, if the master bedroom or bedroom of a married couple is in the south-east direction of the main building, it results in unnecessary quarrels between them or increase in wasteful expenditure. A television should never be placed in the bedroom, but if it is necessary it can be placed in north-west of the room. And a computer can be placed in south-east corner of the room.